Polyomaviruses [BK virus (BKV), JC virus (JCV) and simian virus 40 (SV40)] have been known to be associated with diseases in humans for over thirty years. BKV-associated nephropathy and JCV-induced progressive multifocal leukoencephalopathy (PML) were for many years rare diseases occurring only in patients with underlying severe impaired immunity. Over the past decade, the use of more potent immunosuppression (IS) in transplantation, and the Acquired Immune Deficiency Syndrome (AIDS) epidemic, have coincided with a significant increase in the prevalence of these viral complications. 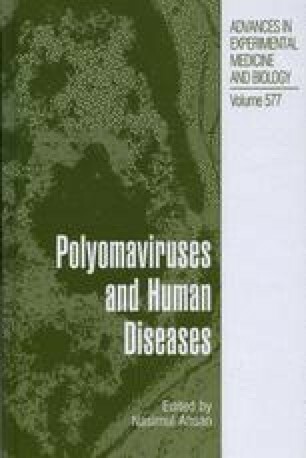 Prophylactic and therapeutic interventions for human polyomavirus diseases are limited by our current understanding of polyomaviral pathogenesis. Clinical trials are limited by small numbers of patients affected with clinically significant diseases, lack of defined risk factors and disease definitions, no proven effective treatment and the overall significant morbidity and mortality associated with these diseases. This chapter will focus on a review of the current and future research related to therapeutic targets and interventions for polyomavirus-associated diseases.